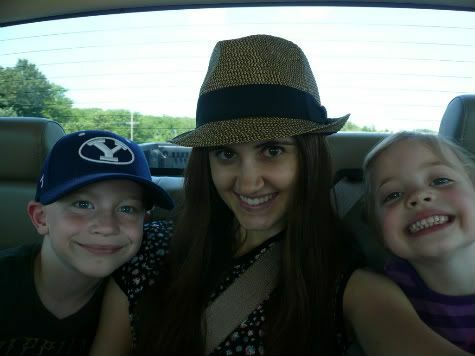 Zach, me, Lily on the way to the pool! Part eins (1 auf Deutsch) of hopefully not too many! Kevin and I hung out in Kansas City, Missouri to visit the in-laws and fam for the 4th of July weekend [June 30, 2011-July 5, 2011]! It was very fun! I can't wait until we go back to visit again! June 30: So, we flew in late Thursday night and checked out Kevin's parents' new hot tub before we hit the hay! They just got a hot tub and it's amazing! It plays the radio or your iPod, has a towel warmer area, adjustable jets for each seat, a little waterfall, a cooling off sitting space where you are seated higher than everyone else, and some sweet lights where you have the option for them to be strobe lights or whatever you want! Maybe someday far in the future we will get a fun hot tub! PS. The strobe light feature along with loud music is the best. Kevin and I had a little rave in there one night. July 1: Friday we ate lunch at the Painters (Kevin's sister's fam) and then went swimming! As we were on our way to the pool I realized I had only gone to the pool once the whole summer, isn't that pathetic? It was only for an hour or so when my dad and I went on a business trip in Florida! I really need to get out more! We went to their neighborhood pool and it was very relaxing! We swam around with some of the kiddos and hung out on the lounge chairs! Afterwards we all hung out at Greg & Kathy's house. We just kicked it for awhile and I played with some of the nieces and nephews in the basement...here are my adorable nieces and nephews! Some liked to be photographed more than others! 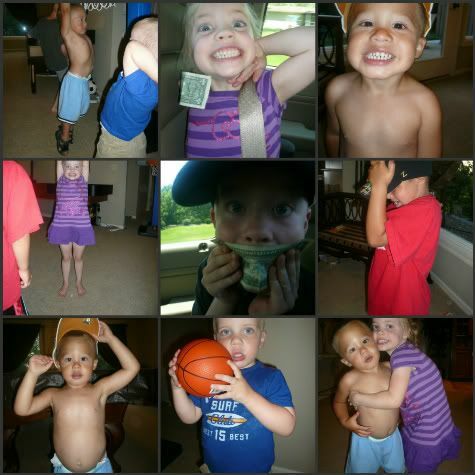 And thanks to Photobucket some of the pictures are kind of cut off...thoughts? Then Kevin and I watched the first Lord of the Rings movie. I actually fell asleep early into it. July 2: The whole family headed off to a family fun center to play Whirlyball and some arcade games! Anyone heard of Whirlyball? It is a combination of bumper cars & lacrosse! What the heck? Yep, it seems crazy but is really sweet! 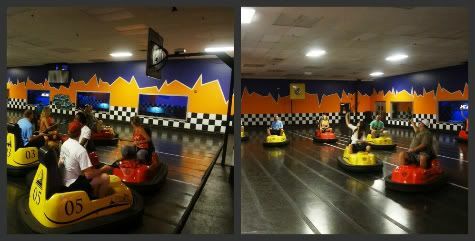 I had never heard of it before we played it there but maybe there is a Whirlyball location by you haha. This game was really fun and it is safe to say that Kevin's whole family is really competitive haha. After the intense Whirlyball game we all ate a buffet and had some fun on the arcade games. Of course Kevin took advantage of my naive-ness and convinced me that after I had lost in a jump rope type game (it is a flashing light that you jump over) that it was still going. I kept jumping even though it was in some stupid normal mode as Kevin took pictures and filmed it. So yep, sometimes I will believe most everything you say :) Haha. We also rode on some indoor go carts and even if you don't think they are going to be fun because you are older, well, they may surprise you! After the family fun center we went to the pool and then the grocery store! Check out these sweet Stackermallows! Has anyone tried them? They are flat marshmallows PERFECT for s'mores! We actually didn't get any but maybe next time we will try them! For dinner we ate pesto gnocchi with pine nuts in it. Yum! We hit up the firework stand and watched Battle LA. Okay I fell asleep to it again! I don't know how we did this much stuff everyday! How were your 4th of July celebrations?! So fun!! :D That hot tub sounds AMAZING!! I want one! 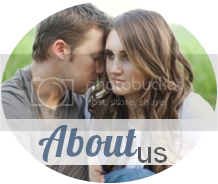 For the PB photos- you can move them around to get them centered or try resizing them all together before you collage them. I'm usually too lazy for that. Haha! I really want to try those marshmallows! We were going to buy them for our camping trip but forgot! Boo. Fun trip! That gnocchi sounds amazing, I love gnocchi! oh my goodness all these babies and cute little kids....i want to have one. i'm 19. is that bad? Thanks for stopping by and visiting my blog! Yes, I live in Germany! Next time you come here, you should definitely visit me in Cologne. It's such a great city! I just clicked "+1" for this post! Sounds like a blast! 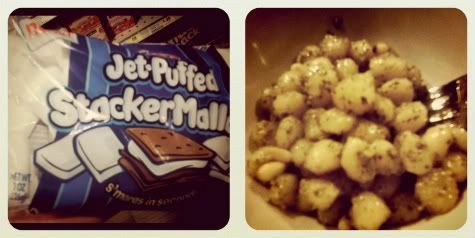 I can't believe they sell stacking marshmallows, doesn't that kind of ruin the awesomeness of s'mores?!? All of a sudden work is blocking your pictures! NoOoo!!! Love the pictures but cannot get over the fact that you have only been swimming twice! And that hot tub...holy Hannnah! Looks like so much fun! We roasted marshmallows not that long ago and my brothers-in-law pulled out these monstrous giant marshmallows. I'd never seen any so large before! Let's just say I couldn't fit even one quarter of it in my mouth. tomorrow! I will send them along tomorrow! Ashley, your weekend sounds amazing and that hot tub! My goodness. Makes me want to have one too....sigh...I can dream. And a post can never be too late, as I am posting about my 4th July weekend tomorrow. thanks for your comment. I live in Puglia near Bari..it's not well known among foreigners, but it has some lovely places to go to. Have you heard of it?